Does Losing Weight Make You Tired? There's no doubt that shedding extra pounds can lower your risk for health conditions like diabetes and heart disease. However, rapid weight loss because of a too-restrictive or unbalanced diet can leave you feeling tired instead of rejuvenated. Always check with a health-care provider before starting a diet to ensure that you are getting the nutrition your body needs. If you are following a starvation-type diet, the insufficient calories you are taking in will lead to fatigue. You also are likely to experience irritability, poor concentration, apathy, depression and anxiety. With such a diet, much of the weight you lose is prone to be muscle, which results in increased weakness. Because your heart is a muscle, it can be affected by a very-low-calorie diet. It may become so weak that it has trouble pumping blood throughout your body, and your blood pressure may drop, which will cause fatigue and dizziness. Such a diet also causes water loss, which triggers the loss of essential vitamins. If the diet plan you are following is not nutritionally balanced, you may suffer vitamin and mineral insufficiencies that make you tired. Insufficient iron, magnesium and potassium all lead to fatigue. Low potassium intake also causes muscle weakness. Inadequate amounts of vitamins C, D and B complex vitamins also may cause tiredness. Vitamin D insufficiency can cause aches and pains. Vitamin overdoses also will lead to fatigue. If you are boosting your diet with supplements, check the dosages. For example, consuming too much vitamin D can cause fatigue and generalized muscle weakness. Excess vitamin A will lead to tiredness, headaches, nausea, hair loss and loss of muscle coordination. Your best bet is to consult a doctor to establish the proper levels of each vitamin because these will vary based on your age and gender, according to the "Nutrition Almanac" by John D. Kirschmann. Inadequate intake of any macronutrient – carbohydrate, protein or fat – can lead to fatigue during weight loss. For example, a high-protein, low-carbohydrate diet triggers quick weight loss by stimulating fluid loss in your body. But this quick weight loss causes your muscles to lose glycogen, which is the main source of energy for your muscles. Depleting your glycogen stores leads to fatigue. 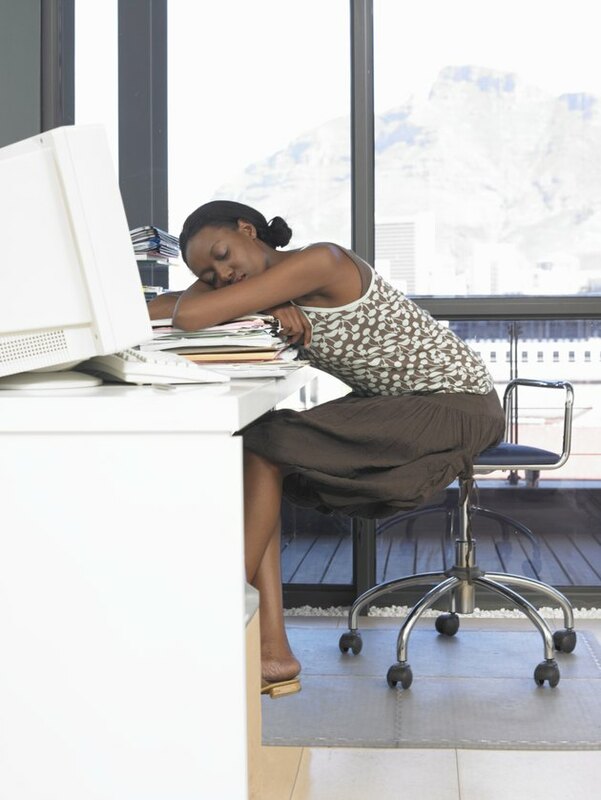 Your body uses carbohydrates to replenish glycogen stores, so a low-carb diet may also cause tiredness. Protein, meanwhile, helps convert food into energy and fat is used as reserve energy. Your body needs some fat to function properly, but consuming more than 30 percent of calories from fat daily can make you sluggish. Can Vitamin B-6 Help You Lose Weight? Does a Vitamin Deficiency Cause Weight Gain? Why Did My Vitamins Cause a Headache?